It’s hard to find the right words when something tragic and unexpected happens. Many food bloggers know, but you all may not know that food blogger, Jennifer Perillo, quite suddenly lost her husband when he suffered a heart attack last weekend. They have two little girls. The news has not left me. I’ve never met Jennie, but I can’t help but think of this young mom losing her husband in a flash. This kind of sudden news can make you question everything you were comfortable with in your own life. Jennie has asked us to make Mikey’s favorite pie, this pie, and share it with people we love. Feeling helpless, I was more than happy to oblige. I shared a piece with the love of my life last night as the sun set. This morning I’m bringing a few pieces to work because I feel lucky to work with really great people. On Saturday, I’m bringing some pie to share with good friends of ours. I plan on spreading as much love as possible. You can make this pie in Mikey’s memory and share it with the people you love most. Also, Shauna of Gluten-Free Girl posted an e-mail address if you are interested in sending homemade care packages to Jennie and her girls. She’s also putting together a fund where people can donate, but those details are yet to be determined. Today is another good day to count your blessings. 1. Add the chocolate cookies to a food processor and pulse to fine crumbs. Place cookie crumbs in a medium bowl and add melted butter. Stir with a fork to mix well and then press into the bottom and 1 – inch up the sides of a 9 – inch springform pan. 2. Melt chocolate in a double boiler (or heat proof bowl over a pot with simmering water that is not touching the bottom of the bowl). Pour melted chocolate over the bottom of the cookie crust and spread to the edges with a spatula. Sprinkle peanuts over the melted chocolate and then place the pan in the refrigerator while you prepare the filling. 3. Using a stand mixer or electric hand-mixer, whip heavy cream until stiff peaks form. Transfer to a small bowl and store in the refrigerator until ready to use. If using a stand mixer, wash the bowl for the next step. 4. Using a stand mixer or hand-mixer, beat the cream cheese and peanut butter on medium speed until fully combined. Reduce speed to low and gradually add confectioners’ sugar. Add the sweetened condensed milk, vanilla extract and lemon juice. Increase speed to medium and beat until all of the ingredients are combined and the filling is smooth. 5. Stir in 1/3 of the whipped cream into the filling mixture. Fold in the remaining whipped cream until combined, but without losing the air from the whipped cream. Pour the filling into the prepared pan with cookie crust. Smooth top with a spatula. 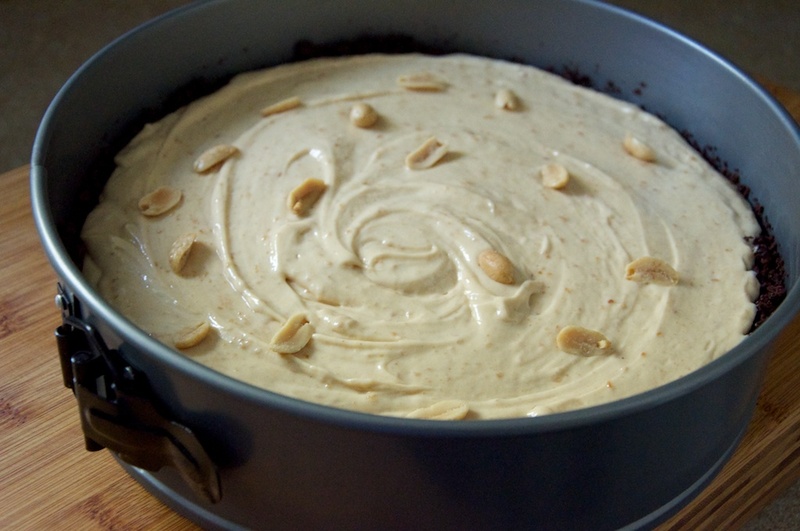 Garnish with extra melted chocolate and/or extra peanuts and refrigerate for three hours or overnight before serving. Share with someone you love. Mentioned on: Creamy Peanut Butter Pie – #APieForMikey — Recipe - Creative Culinary - A Denver, Colorado Food Blog - Sharing food through recipes and photography.